What I wasn’t expecting when I attended this Richard Tauber Prize recital was that it would be the final recital in the history of the competition and after 30 recipients since 1951 it will be rolled into the Wigmore Hall International Song Competitions from 2013. The new Prize will be awarded for the best interpretation of Schubert lieder and it will not carry a Wigmore Hall recital as part of it anymore. A slightly sad but also a good chance to look through the list of the singers that received it over the years, some went on to great careers and some sank without a trace. Jung Soo Yun fresh out of Opera Holland Park’s Pearl Fishers gave a charming and at times arresting performance. Not a singer to exude ego or unshakable, bombastic over-confidence, but more of an at ease generosity. His Schubert songs went past in a flash and his voice did not make for a classic combination of material and texture. Sometimes these songs can turn a little be too polite and knowingly elegant and my personal taste veers on wanting a more gritty, more assertive sound. His Strauss songs, especially Die Nacht showed his impressive ability to shape and colour phrases into an evocative mix of picture making prowess and animated evocation. His open eyed eagerness when singing Nichts had that fresh quality only a younger singer can bring, a feel of young love and melancholy. For Die Georgine he successfully managed to pull back some ardency to allow the lyrical flow to emerge and display a more demure personality in his singing. The songs by Tosti were a late addition to the programme from what was previously advertised and I can declare him my least favourite art song composer. So was not particularly looking forward to those three songs. But they were proven a great vehicle to display his punchy squillo in Non t’amo più projecting with clarity and ringing sonorities, raising the material above its banal footing. For Ideale depending on his affable stage presence he also impressed with some very italianate rolled Rs in the pivotal line Torna, caro ideal, torna un instante adding a delicious sharpness to it. It is always enjoyable when a singer picks songs from their own culture and language to sing in recitals and the two Korean songs were so much fun and extroverted that gave a triumphant closing to the song part of the recital before giving way to the two arias. Especially the Sailor’s Song elicited a lot of laughs of admiration and recognition by the numerous Koreans in the audience. The two arias were by far the most evocative and interpretative complete items. His Faust was elegant and beautifully projected accompanied by great finesse. The attention to the gentle phrasing and the open throated, secure production was a joy to listen to. His Kuda kuda was restrained and filled with dignity and passion. The reflective mood making for a great end to a recital. He may not have the fetching appearance of Pavol Breslik in the recent ROH Onegin but he definitely can deliver the complex lustful shady world of this aria to good advantage. Joseph Middleton’s accompaniment was unshowy and communicative without sounding routine. Never trying to overshadow but a team player offering support and propulsion. His encore Dein ist mein ganzes herz was dedicated to Tauber and sung with great beauty and bounce and the second one was The Lord’s Prayer in Korean, which you can listen to in the curtain call video below. Based on this fetching recital I wish I had seen his Nadir at Holland Park but it is one of those operas that rarely appeals. His Royal Opera debut is coming up this autumn in Les Vêpres Siciliennes directed by Stefan Herheim and will be great to see him as part of such an ensemble cast in a fairly rare opera by Verdi. Another young singer to add to the list of up and coming new stars. @OperaCreep @wigmore_hall For all those who can't get to the Tauber Prize Concert tonight: http://t.co/5Ne75IGTfr Pure delight! 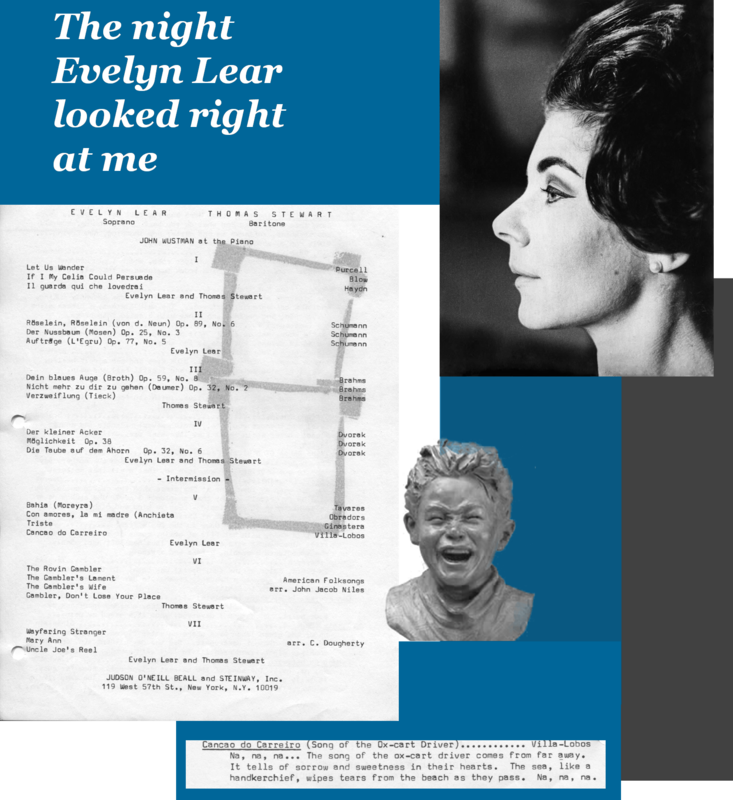 I can never see or hear the name Evelyn Lear without flashing back to a night in 1967 when I humiliated my mother at a recital by the soprano and her husband, the late baritone Thomas Stewart. 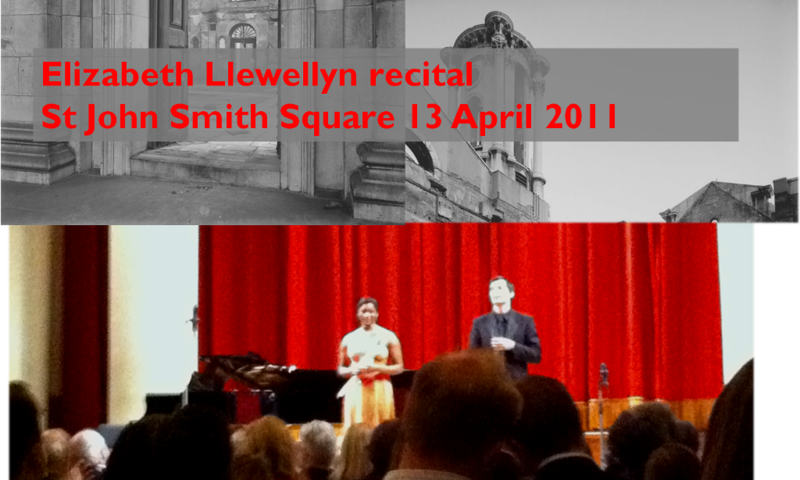 By this time, despite my youth, I was a veteran of two years of opera-going, and this was my second vocal recital. So it’s not like I didn’t know how to behave at these things. But I was still, after all, a kid. The opening set of the recital’s second half consisted of four songs sung by Lear, the fourth being Villa-Lobos’ “Canção do carreiro (Song of the Ox-Cart Driver).” The refrain includes a funny little high-pitched shriek that instantly struck me as hilarious. As it repeated, with Lear making a “cute” face each time, well, I totally lost it.As I felt persistent jabs at my left arm from my mortified mom, I shook harder and harder, sank lower and lower in my seat, and turned redder and redder as tears streamed down my face — all as I vainly tried to suppress my attack of the giggles. And all the while there was Lear, standing onstage maybe 20 feet directly in front of me and staring straight at me as she sang, looking, well, ready to run me over with her very own ox cart. And at the end of the song, what did I do but stand straight up and applaud as my mother tried to hide her face with her hands. “Sit down! She was looking right at you!” Mom said over and over again, trying to pull me back into my seat. But that to me meant, “Cool! Evelyn Lear looked at me, wow!” But she wasn’t looking “right at” me as I stood and clapped. I recovered from my laugh attack, and the recital continued, concluding with two encores: “Bess, you is my woman now” and “La ci darem la mano,” which ended with them leaving the stage together. We got it, time to call it a night. Of course I insisted on going backstage to see them in what passed for a green room. My mother was horrified at the very idea (“She was looking right at you!”) and refused to go with me. But: I. Would. Not. Be. Stopped. There was more of a group crush than a line per se to see them, and it puzzled me that Lear, who was more the center of attention than Stewart, seemed to be urging everyone in my general direction over to her one by one but me — and noticeably avoiding my eager glance. Was I just too short for her to see among the grown-ups? (Hm, don’t think that was it …) As the crowd thinned and I became unavoidable, she kind of looked through me as she greeted me, icily, and half-smiled, wearily, while I told her how wonderful she was, etc. Thank goodness for Stewart. I’m not sure who he was rescuing more, his wife or me, but suddenly this big (huge, to me at the time), dashing international opera star pulled me over to his corner of the room and, after hearing me out about how much I enjoyed the recital, spent many uninterrupted minutes with me, asking who I was, how old I was, why I was there, how long I had been listening to opera, etc. He treated me with patience and kindness, but did see to have a genuine curiosity about how the youngest member (clearly) of the audience had come to be there — to, among other things, laugh at his wife. I left smitten — by both of them. Of course I later saw Lear and Stewart sing many, many times at the Met. But to this day, whenever I come across either of their names, I’m right backstage at that vocational high school, full of wide-eyed, youthful enthusiasm for this pair of remarkable and much-loved artists. And Mom’s hiding out in the car. It was the longest day of the year and a very sunny one at that (shock horror, I know, Londoners) so it was imperative we had a good time during this recital as the all too rare warm day was passing by. And having a singer with a German surname, an English accent and actually of Spanish origin was a conundrum that she even joked, from the stage, about. This recital exuded sunshine in more than one ways, my companion exclaimed at the tanned physique of Simon Lepper only to wonder if it was fake tan and then the charming and overall winning demeanour of Sylvia Schwartz made for a sunny start. Also cannot remember the last time I’ve seen an opera singer wearing a three strand pearl necklace…a nice glamorous touch. 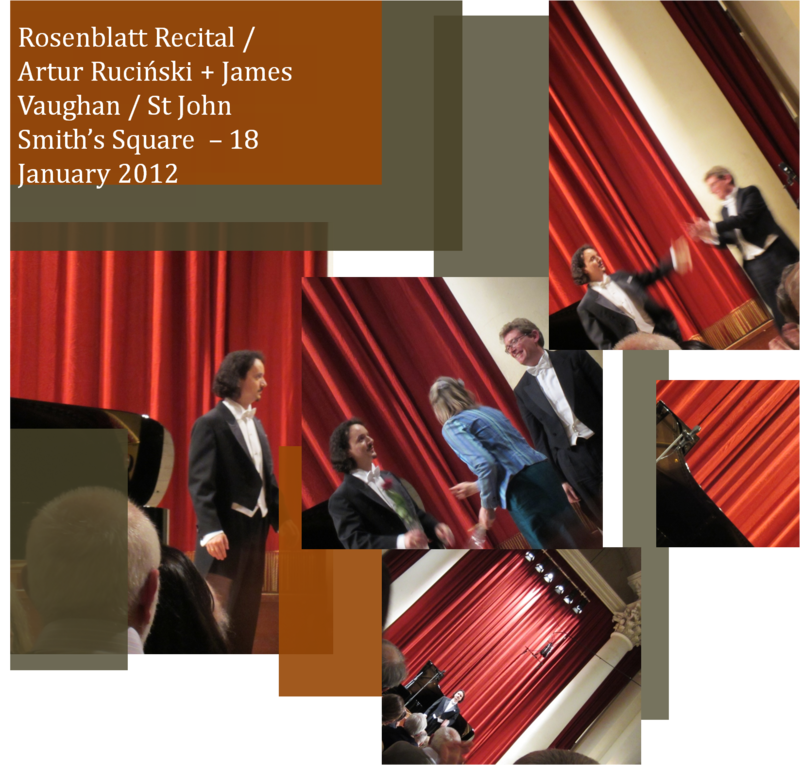 The programme of the recital was very promising but the first half was sadly disappointing. Despite the immense beauty of her timbre and her faultless projection she seemed to be pushing too much her upper register straining delivery and sometimes sounding shrill. The first two songs were very demure and some beautifully floated notes in Parisotti’s Se tu m’ami opened the recital with a relaxed and totally charming way, very akin to her wholesome stage presence. The Gluck maybe not have been accompanied by the most sophisticated piano playing but O del mio dolce ardor was sang with tenderness and great beauty. Displaying a great understanding of the neo classical nature of the piece. In total contrast her two Cleopatra arias from Giulio Cesare were too taxing and sang not in the appropriate manner. Having seen Sarah Tynan sing an amazing Cleopatra for Opera North earlier this year I’m afraid she set a high standard. Schwartz’s ornaments just seemed out of place and not in keeping with Handel’s writing, the coloratura passages were dispatched with such constraint that took away the sheer luxury of the sound he demands. This was possibly a choice of repertoire that needs her voice to fully flourish first in the coming years to give her the confidence and the right fuller texture. Her Ah! non credea mirarti started with great affinity for the melancholic atmosphere of Bellini’s bel canto caper. But unfortunately her languid, gorgeous tone was not a substitute for a solid grasp of how to deploy portamento and legato. The different parts of the aria felt disjointed and some of the smoothness and attention to the linear structure of Bellini’s writing was lost. It was hugely disappointing as she surely has a very beautiful voice but again don’t think she was ready for the stylistic challenges it posed. The first half was meant to have finished with Una voce poco fa, but was announced after the second number that it didn’t fit in the programme, so it was removed. The second half proved a much more even and thoroughly pleasurable part of the evening. She literally let her hair down and it showed. Her three Rossini songs were a great fit for her voice and her vocalise on the simple, reflective melodies was enchanting. The concluding La promessa was full of longing and childlike purity of spirit. The following Six Castillian Songs by Guridi were the absolute highlight of the evening, proving once more how important it is for a recitalist to choose material in their native language. The interpretation aspect of them was mature and playful. The conclusion of the first song was soft and light Entra labrador si vienes a verme/Enter, farmer, if you come to see me was just warm and heartfelt. Her opening ¡Sereno!/Nightwatchman! was arresting and clamorous, changing the mood. Once more the piano accompaniment left a lot to be desired, with attacks sounding too agitated and unbalanced which unfortunately continued on to the next song which was delivered with a sense of drama and poise. Her exclamations mira que el torro te pilla, mira que el torro te coge/don’t let the bull seize you, don’t let the bull catch you filed the church with urgency. The pianissimi in No quiero tus avellanas were delivered with great focus and a sense of grief, reaching a wonderful moment when she spun the line to almost mimic the sound of water while describing it as crystal-clear. 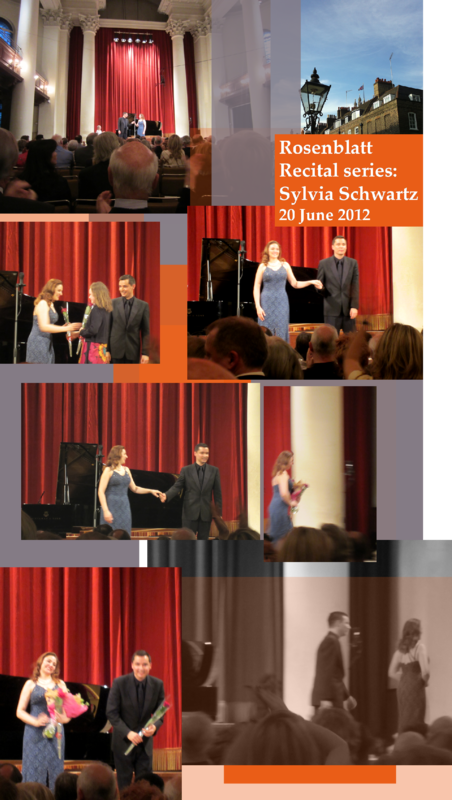 The last two songs were much more demure and melancholic bringing out once more the natural charm and ease of Schwartz. A masterly journey through a very picturesque set of songs and impeccable attention to the text, which was greeted with the loudest of cheers. The final two programmed songs were almost a reminder of the Ailyz Perez recital at the same venue back in March, who sang the Luna song with great spark and girly abandon. Schwartz was animated and added an Iberian piquancy that was a great finale, shame that again the piano playing sounded unfocused. The three encores that followed were by Granados (La maja dolorosa No. 2), Down the Salley Gardens, Britten’s setting of Yeats’ poetry and Turina (Tu pupila es azul). They were beautifully delivered and gratefully received. Vienna State Opera is very lucky to have her and I am definitely looking forward to listening to her again in the near future. 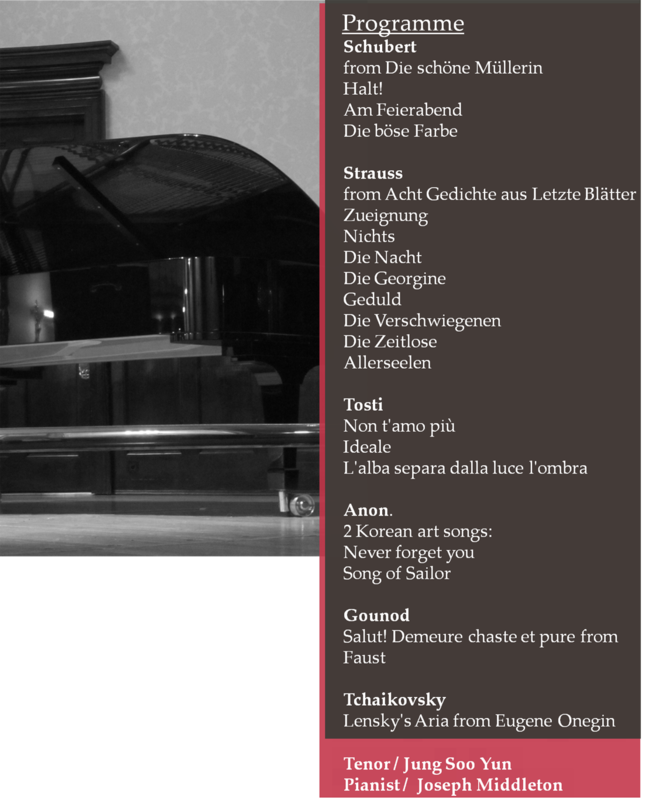 Usually when I attend a recital I tend to be immensely amused and charmed when singers add to their programmes songs in their native language. This recital will be the exception, both the accompanist and Ruciński seemed too ill at ease with the four sonnets. I would guess lack of enough rehearsal time was to blame. Sight reading the lines in Polish from the score throughout was a pointer to that. Thank heavens they tweaked the running order and the interval came after the aria from Faust, otherwise I am not sure I would be too willing to return after the interval. His two arias from I Puritani and Don Pasquale were great vehicles to display his limpid tone and fearless delivery. His passion and sadness as Sir Riccardo was palpable and his first fortissimo passage did make a few members of the audience shudder, he can be very loud if the piece allows, which was very effective with the too neutral and dry acoustic of the space. His Dr Malatesta was good fun but somehow I felt a gap between an attempt at interpretation and his clear intention to please the all (too approving) audience. He was surely a buffo baritone but somehow the character as envisaged by Donizetti was missing. His Valentin was not a good fit for his voice type, his French delivery was not as unforced as his flowing Italian and maybe the voice is a tad too strident and steely for this repertoire. The interval came and I was thinking of the strength of his voice and the powerful delivery and the lightness of touch in bel canto. His Count Almaviva was surely acted and he wasn’t just playing to the audience. Clearly a result of his stage experience in the role. It may sound harsh, but despite the limitations of the concert platform, interpretation is possible if not more needed than when in a fully staged performance. His Count a thinking, living character, the last ringing Il colpo e fatto was a great signifier his arrogance and moved on to a climatic signature Mozartian expression of rage. Up to that point that was the most natural bit of singing of the night. The two Tchaikovsky arias were a very good fit for his voice, the tautness of the sound was fresh and the Russian sounded involved and a proper romantic opera interpretation. At times his Onegin sounded on the sharp side but the overall atmosphere and confidence were winning. Unfortunately the accompaniment maybe was not up to his standard, with a tentative touch Vaughan did not sound fluent enough. The final programmed aria was for me the best piece of the evening, for the first time his projection was full bloodied and from the mask, the voice lost any steely edge it had up to that point and delivered a wonderful rendition of Rodrigo’s death aria with passion and more empathy than displayed earlier in this recital. A total joy to listen to, the phrasing was elegant and attuned to what a grand opera by Verdi requires. The loud cheers were truly deserved. His encores were Di Provenza il mar from La Traviata and Votre toast, je peux vous le rendre from Carmen were a good way to close the recital. Despite my misgivings at asking the audience to clap for the toreador aria and throwing the rose he was given straight to a woman on my row! But it was a bit of fun on a Wednesday evening and hope he returns to London for maybe some fully staged Verdi in the very near future. On the whole this was a great introduction of the singer to a London audience, as always with this recital series you never know where the singers will be in the next five years. Judging on the stars they gave the stage to, early on in their careers, it’s a great place to see the stars of tomorrow. Véronique Gens left a huge imprint in my mind and heart after her performance of Niobe Regina di Tebe at Covent Garden last year. She was the beating heart of a truly accomplished, odd ball piece by Steffani. 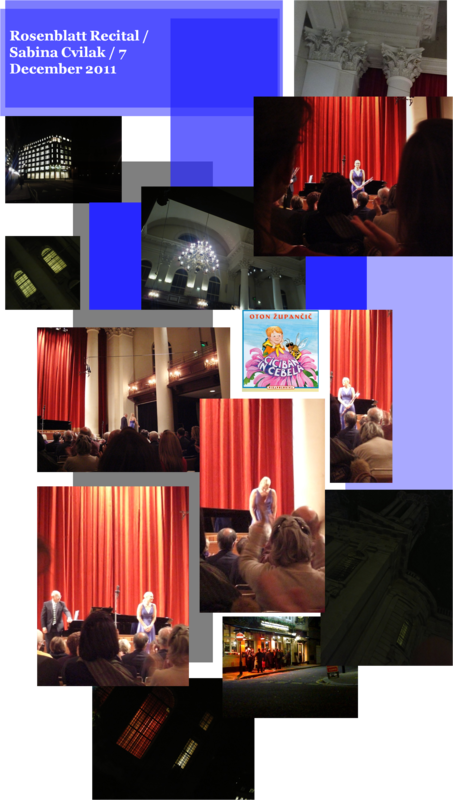 Her voice was silken and alluring, her stage presence involving and I really don’t know what is the management of the Hall thinking booking such a great artist for just a one hour long recital of French songs. But we’ll gratefully accept what we can get! This recital was a walk through in French chanson by three highlighted composers (Massenet, Gounod, Hahn); setting mainly 19th century literary grandees (Victor Hugo, Theophile Gaultier) guided expediently by the sympathetic and rounded playing of Susan Manoff (a great favourite of French opera divas on the concert platform). The songs by Massenet sang were delivered with lightness of touch and panache. Almost as softly as Gens’ hand was lying against her side. Despite her blazing red/orange dress her approach to singing was about the understatement. She clearly inhabited the material but was not being predictable. Her silences and fading notes seemed as important as her crescendos. She transported us to fields and the side of the sleeping beauty, with such a simplicity of means that was unforced and relatable. When she asked O grands bois, pouvez vous me dire Que devient l’âme des oiseaux?/O forests, can you tell me what becomes of the birds’ soul? ,one doesn’t discount it as the absurd questioning by a mad lady, it’s more verging on a forest psychodrama. Her La mort de la cigale was the first moment of reflective singing, up to that point everything was breezy and more sweet. The reflections on mortality by referring to the lifecycle of the cricket and how its end coincides with the end of the harvest. She allows the silences and the pacing that Manoff dictates to create a notional space where the meaning ferments. Sounds maybe pretentious to suggest that, but looking her straight in the eye while delivering the lines, there was a look of certainty and wisdom that was convincing. This section closed with a Spanish flavoured fantasy with a certain amount of sexiness. Her hands almost describing the touching of the loved one, helping to create the atmosphere of lust, the song closing in a triumphal loudly exhaled amour! Her Gounod and de Polignac section was focusing on female characters again, from a rebellious belle, to the gorgeously sang Prenda garde/Beware! almost in a similar vein to some 15th century chant by Stile Antico she described a femme fatale that lies to have her own way and asked all listeners not to believe her and to beware. Just the turn of phrase every time she emphasises every warning is both amusing and faintly serious. The Lamento/Lament by de Polignac is a quiet, almost morbid tableaux giving respite and stillness to the recital and altering the faster rhythm up to that point. The fantasy of the young maid that wants to be taken to the land of love in Où voulez-vous aller?/Where is it you would go? was animated by the vocalise representing the billowing sails in the wind, a wonderful sound suggesting images with the smallest amount of detail, a shorthand weather forecast if ever there was one. The upcoming Sérénade/Serenade was a pulsating, almost danceable tune with her vocal hovering over it, so very simple but still a most beautiful lullaby imaginable. Voluptuous harmonies and expressive colouring added intimacy and flow. The final section by Hahn was a more reflective set of songs as a whole. The outstanding highlight is Trois jours de vendange/Three days of vintaging describes the meeting with a beautiful girl at harvest and within 5 mins we are transported to her death three days later. The way she delivers the two crucial lines Le cercueil était couvert en velours, Le drap noir portait une double frange/The coffin draped in velvet, the black shroud had a double fringe under a heavy sounding piano is just exquisite. A certain Gallic melancholy feels the air, she was retelling this story with empathy and true sadness. This is the unique winning quality her singing conveys, it does feel genuine and just leads us up the path hand in hand. As you can tell from the above I am totally in love with Véronique Gens and it’s a good thing to admit it too. She is truly an original, engaging artist that does not resort to easy histrionics but is a thoughtful, mature and complete singer. The velvety beauty of her voice, her lithe appearance and her gift for communication is an intoxicating mix. While I was being Wigmored (a great term to describe how the older members of the audience block all exists from the auditorium, thanks Twitter!) on the way out all you could hear were joyful expressions of appreciation and love. She surely acquired many more fans today (including my other half) with such a wonderfully radiant performance (despite a minor cold that she was nursing). You can hear it all live within the UK on the iPlayer. It will also be repeated this coming Saturday at 14.00 on BBC Radio 3, so tune in or record it and keep it to listen again and again. 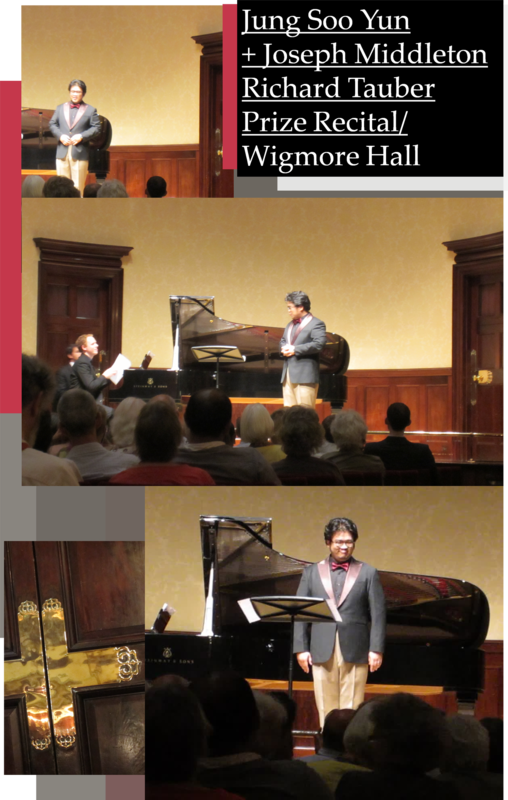 There’s hoping that Wigmore Hall Live will release it in the near future, I’ll be first in line to get a copy! I’ll close this with a different rendition of the encore she sang by Poulenc. Another recital at St John Smith Square, another time I adored the architecture but still found the venue to lack in atmosphere. Something about the stark crisp whiteness and the very dry acoustic somehow is not giving me a warm fuzzy feeling. Cvilak thankfully had no issues filling the space with her beautiful and clearly projected voice. She is a really interesting case, a singer with a very lyrical voice but with an almost chilly timbre. On the surface she seems to lack inbuilt warmth but she clearly knows how to coax emotion when the repertoire calls for it. Saw her take part in a wonderful performance with the London Symphony Orchestra under Gianandrea Noseda of Britten’s War Requiem and she was very expressive then but maybe mismatched to the demands of the piece …but still, a mile away from her tours around the world accompanying Andrea Bocelli. The recital started with an inversion of the advertised running order of the three Slovenian songs. They were a very well chosen ice breaker and a characterful, whimsical choice too. Maybe I’m impressionable but, I’m always charmed when singers choose songs in their native tongue. Her approach was lyrical and very tender. Her unforced delivery was endearing and convincing. The two first songs were mournful and ever so slightly unhinged (the line :’ My father cursed and beat me, mother is crying over me, my family is ashamed of me, all fingers are pointing at me.‘ comes to mind). For me Ciciban was a great end to this section, a tender telling of the story of a little boy that gets approached by a bird that reminds him to wash his hands…never before I had a pedagogic lesson on hygiene for the under 5s, delivered with such sense of fun and panache from a concert platform, Julie Andrews would be very proud! The next group of songs by Hauer based on poetry by Hölderlin, they were beautifully delivered and with impressionistic pianistic touches by Iain Burnside. But the best was still to come. The three Richard Strauss songs were a torrent or changing emotions, from hushed loving words to proclamatory fervour to the dreamy evocation of a ghostly lover. Again Burnside seemed to be in his element accompanying with great taste and allowing Cvilak to float phrases, creating the right atmosphere for these youthful efforts of the lovestruck young Richard. Those songs led to the interval leaving us all looking forward to the arias in the second half. Somehow to sing at least one aria from La Bohème is something any lyric soprano tends to have a go in recital. Cvilak’s effort may have been short on actual vocal softness but the aria was infused with true understanding of the style, clear enunciation and a charming stage persona. The audience surely reacted to her interpretation and gave her one of the loudest applauses of the evening. Next up was Suor Angelica’s big aria, which I saw in the recent Covent Garden Il Trittico sang by Ermonella Jaho, who brought the house down with a searing interpretation that was immensely moving. Cvilak’s instrument is much cooler in temperament but still somehow managed to negotiate the aria without allowing it to turn twee and a routine effort. My only criticism would be her inadequate use of portamento to colour further the aria and give it a more touching effect. The final Viennese operetta section was a delight, and actually a great fit for a mid week recital. It made us tap our toes and have fun with the happenings on stage. In particular the second aria (Du sollst der Keiser meiner Seele Sein) on top of all the fun, it also gave us the chance to hear a much deeper colour of her voice, as she used much her darker end of her tone to great effect. Which made me wish she had done the same with Suor Angelica, but maybe the temptation of a nun in white was too much to resist. Of course closing the programme with the Merry Widow was a total crowd pleaser and she really gave her all, fleshing out the character with nonchalance and sexiness with wonderfully clear, ringing high notes. We were treated to two encores, both a logical step from the Puccini arias on the programme, her Io son l’umile ancella was passionate and at the same time desperate and resigned. A wonderful showy aria that any lyric soprano with a taste for verismo can create a huge impression, Cvilak did make a big splash again, staying on track with the required style and not resorting to the quite standard maudlin treatment. Her ‘Room with a view’ moment was surely full of freshness the aria requires but somehow did not have enough of a pleading quality. On Wednesday night she was lucky enough to have an accompanist of immense sensitivity and dexterity and also a well chosen, varied, entertaining repertoire. Can’t imagine a single person in the audience didn’t enjoy the recital. Looking forward to hopefully seeing her in fully staged opera in the coming years and what other roles she will tackle. This was a very interesting evening, one of those nights one goes home feeling that something beautiful has started. The programme was very ambitious, the first half almost felt something the young Joan Sutherland would have sung, while the second was more like a young Grace Bumbry! That kind of wide-ranging ambition is at once interesting but at the same time does not make an as satisfying live concert as it reads on paper. The first half was marred for me by what seemed rather plodding piano playing for the two Handel numbers, and while her voice was bright and penetrating somehow it lacked the limpid quality the best Handel singers possess. It was well sung but not a natural fit. The Mozart aria was interesting but again it did not quite work in my view and it sounded a bit on the generic side. The Walton cycle was much more sympathetic to her voice and it brought out her charming stage persona with a distinct sense of humour. When the interval arrived I was happy to be there and enjoying myself but somehow feeling a bit let down by the two first arias. On the second half the Strauss songs were very vividly portrayed with a natural sense of drama and joy. Her accurate tone and phrasing were a real treat. This was followed by a truly masterful and heartfelt Mimi, clearly informed by her stage experience, she gave the fragility and the youthful attitude of the heroine in the most wonderful mezza voce with dazzling high passages. As I normally cannot be bothered with Puccini this was captivating and full of study and beauty. Her Verdi was again beautiful but I kept thinking that she was lacking the reserves of a more wide-ranging tessitura, her voice is extremely strong in its middle and upper registers while having a totally underdeveloped lower register, which in Verdian roles adds that extra bit of expression and depth. All the above may seem like a mixed bag of a review/impressions. But I can honestly say that Elizabeth does posses a very warm stage presence and a really remarkable voice that can hopefully mature with a stronger lower register and find repertoire that fits and brings out the most attractive aspects of it. I can imagine her singing verismo with huge success and even Elena in I Vespri and I’m titillated at the possibility for any bel canto roles. This was a very interesting introduction for a new artist and hope it will be the springboard for a fruitful career. It seemed that the concert was being recorded so looking forward to listening to it again in the future and maybe revising this quick appraisal. Yesterday morning had a very interesting start to my day. Customarily scan my timeline on Twitter to see if I have missed anything overnight and have a giggle with the odd post/link. Jessica Duchen broke the news about the performance marking the 60th anniversary of Daniel Barenboim’s first public performance with a free concert on the bridge of Tate Modern’s Turbine Hall (here’s Jessica’s blog: http://bit.ly/f3Z14h) I was rather intrigued by it and quickly registered my details. It seemed like an interesting marriage of old and new, the flashmob mentality with the anniversary of classical music royalty. To my great relief I managed to get a ticket, but to my surprise it was in singular indeed! Whoever though of that at Universal should really review the policy for next time round, concert going are inherently social occasions and I always share them with my partner. At this occasion it’s not going to happen and it sadden’s me. I will make sure I report back (and surely nothing as long as The Iliad, as that tends to be the malaise of blogs today), but I can imagine it will be a very interesting evening ahead. He may have gone too political and maybe rested for too long on the cushion afforded to him by his reputation, but I am all up to be surprised and to be enthralled. He has had an extraordinary career and this will be a celebration suitable for a performer of his caliber. 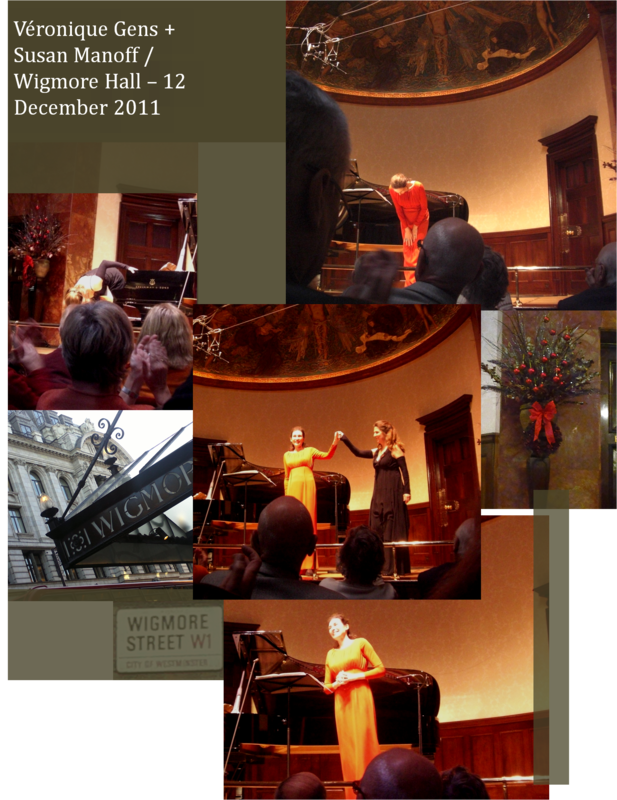 It has been quite some time since I saw Joyce DiDonato perform at The Wigmore Hall (27+29 January 2010). It has taken so long to put my thoughts down in writing. I read about her on Alex Ross’s blog and the fact that he suggested her Colbran disc was for him the recording of 2009, made it an instant purchase. And what a great fireworks display that recording provides! She is captured in radiant voice storming through Rossini arias of extraordinary complexity from La Donna del Lago to Armida. She embodies the Rossinian heroines with an extraordinary wall of sound and a faultless legato. Reading through her blog entries I was terribly moved by her confessional writings and the wonderful insight in to her process of recording and bringing works to the stage. It all seemed unpretentious and truthful. So the next logical step was to book my tickets for the Wigmore Hall concert…and of course it was a sell out…so I kept refreshing the booking page for one day solid till two tickets materialised at Stalls K! I was absolutely delighted, but at the same time I had a small fear, that I may be disappointed by the live experience, having only heard her in a studio recording. It is true that some singers are stage animals that don’t quite know how to inhabit the concert platform, but DiDonato proved on the night that she was quick witted, warm and devoted to the music at hand. Attributes that, for me, are really important for a truly successful recital. The programme was made up of mostly obscure Neapolitan and southern Italian music about love and some interesting and fun pieces that showed off her fun personality. Her performance of Desdemona’s aria from Rosssini’s Otello was easily at the same level as the recording and quite possibly better. Her grasp on the melodic line and the ease of her upper register made it totally magical. Looked next to me and Tim’s face said it all, he was very impressed by her and the confident way she approached such a great aria. With near fearlessness she attacked the beautiful neo-classical structure that Rossini provided her with. It reminded me the attitude that Maria Callas would bring to the stage, an air of tenderness but with steely determination. At that stage a grand new diva had arrived in my life! DiDonato made a joke about the drinks not going any warmer at the bar and asked for permission to sing the prayer from Maometto Secondo, as she had Lucy Wakeford playing the harp (the harpist of The Philharmonia Orchestra)! And it was the most wonderful way to ease in the interval. The second half came and she painted some beautiful pictures out of some frivolous and ever so slightly pedestrian music, in a way only a great artist can. It takes an average artist to do a good job out of a masterpiece, but it takes genius to create ethereal beauty out of competent compositions. And DiDonato achieved that, she inhabited the characters and gave them life and brio. Her two encores were Voi che sapete (she was about to go to The Lyric Opera to sing Cherubino for 11 performances) for which she wore a bow tie as her prop! It was fun and highly accomplished. But the highlight of the night was Tanti affetti from La Donna del Lago, which was my favourite aria from her Colbran cd. Her interpretation was breathtaking, leaving us all wanting more. The 29th I went again, not being able to resist her charms and she was again very precise, but ever so slightly more tired. It was great fun how she reacted when a patron’s phone went off during the solo harp introduction of Desdemona’s aria. She simply asked if it was Otello calling! The reaction was both quick and terribly embarrassing for the person that left the phone on! In the end I had a quick chat with her and her fabulous pianist David Zobel and they were both warm and sweet without a hint of arrogance. It was the kind of refreshing performance that I wish it had been witnessed by a younger audience. It would have dispelled widespread preconceptions about stuffy opera recitals. It was fresh, fun and above all great art! That was a night to get an opera neophyte hooked on the art form. But as it’s usually the case on the first night we were the only a handful of people in our early thirties, most of the audience was a sea of grey hair. PS I was totally shocked to have received three responses from Joyce on my emails before and after the Wigmore performances. And I can’t wait to listen to her performances from Geneva of La Donna del Lago on Radio 3 in July and her Idomeneo from Edinburgh in August. I’ll wish her all the best and of course a full recovery for her much maligned ankle! She is surely a diva for the new era of blogging but with the big guns required to tackle the great canon of 19th century Italian opera and true substance.